This Easy Nacho Bar is one of our favorite family dinners! 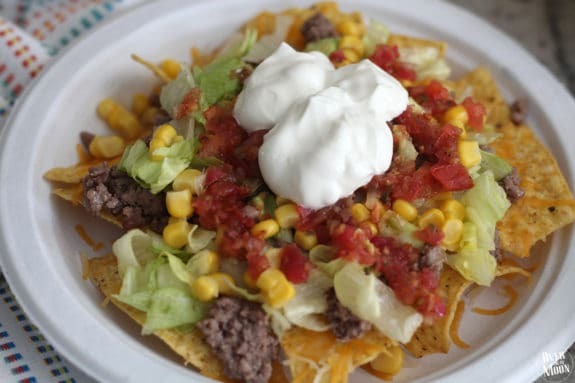 Everyone can customize their nachos however they want, leaving everyone’s bellies 100% satisfied. We’ve had a ton of guests over the summer! Sometimes it gets difficult to feed them all and also find something that everyone will enjoy! 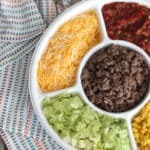 While menu planning a few weeks ago, I got this idea to make a Nacho Bar! That way everyone can create their own custom Nachos — exactly how they want them! IT WAS A HIT! And my kids have asked for it every single week since I first served them! So, today I thought it would be fun to show you how I put it all together! 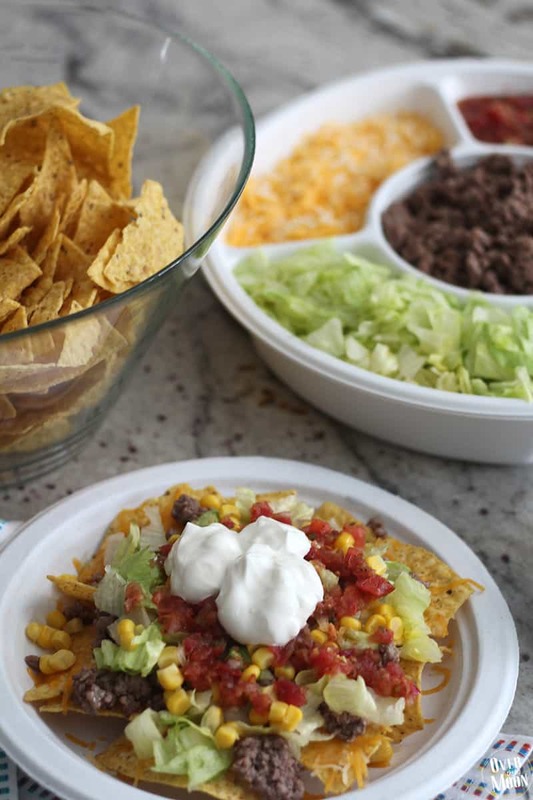 You can make your Nacho Bar as simple or complicated as you want! If you’re serving a big group, I suggest having more options – at least 2 or 3 proteins and 8 to 10 topping choices! 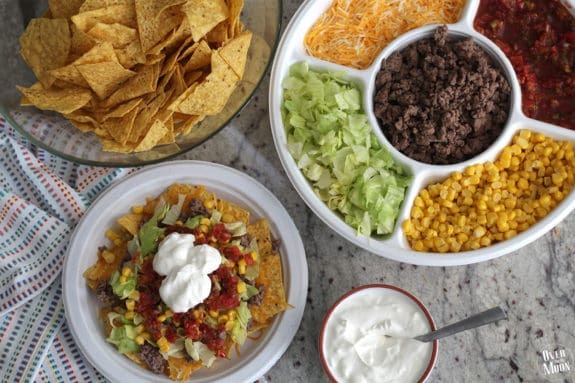 But, if you’re just making your Nacho Bar for your family, then I would keep it to 1 protein and 5 toppings! And in my opinion, Nachos should always be served on paper plates! Then you don’t have to worry trying to clean all that hardened cheese off your nice dishes! 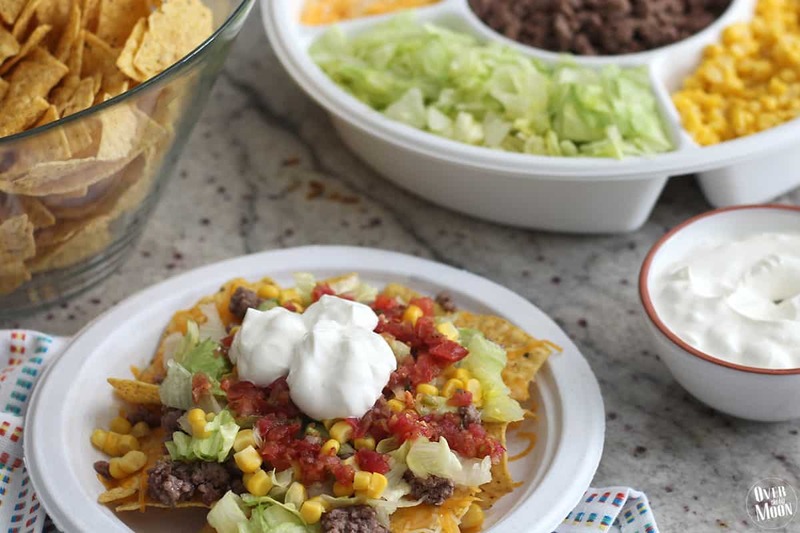 To create your Easy Nacho Bar, get a big bowl for the tortilla chips! If you’re doing a really large Nacho Bar, then I’d suggest you get a few different colors and shapes of tortilla chips and have them all in different bowls. The prep is so so easy! You really just have to cook the protein and cut up any toppings that need it! It only took me about 10 minutes to get everything prepped for this dinner! If your protein is still warm, then have them start by choosing a chip and cheese and heating it up. I just had my guests throw it in the microwave for 20-30 seconds! 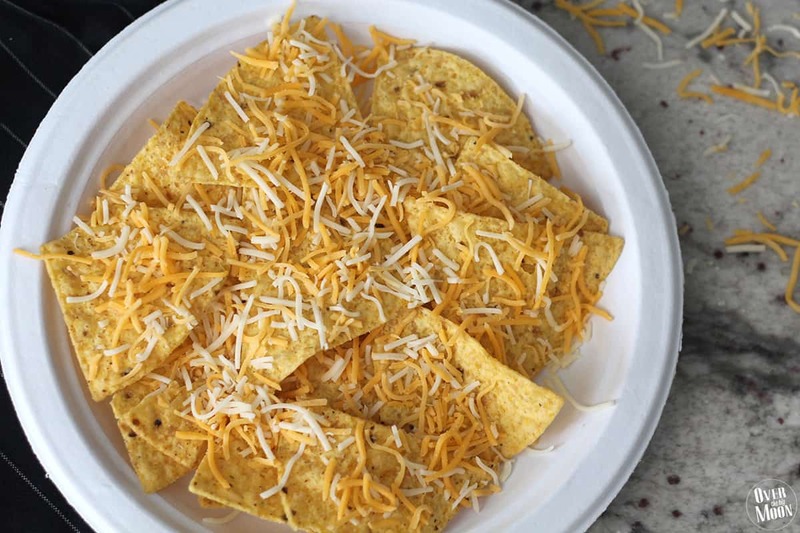 But, if the protein is cold, then have them put the cheese and protein on top of the chips and microwave it for 30 seconds! Then have them pile on any toppings they might want! There is no perfect way to layer all the toppings on, but I do suggest layering biggest to smallest. 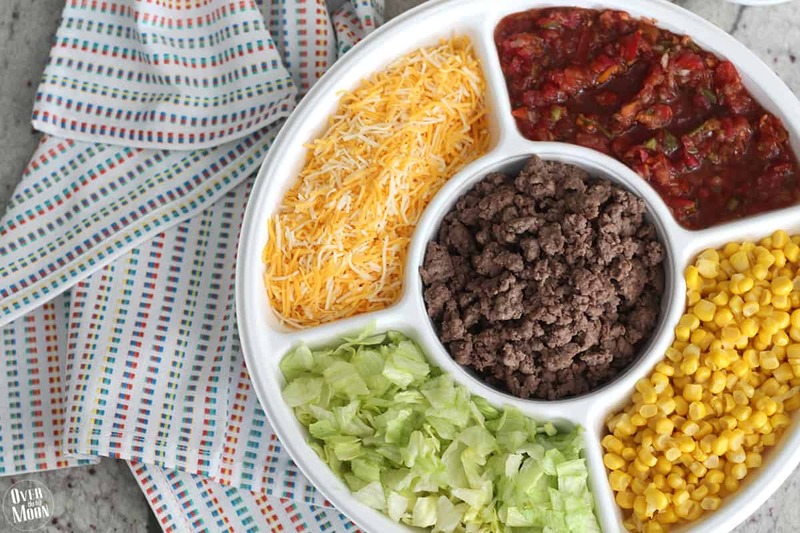 So, in this case, after the protein and cheese, I then layered the lettuce, then corn, then salsa and last the sour cream! Serve and enjoy! Super easy, right? 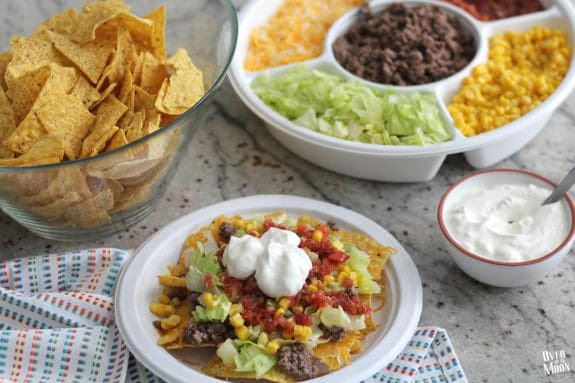 Plus, clean up is so easy, because I always serve Nachos on paper plates! For a small preview of Quick Company Chicken, watch the video below!